Magento is the leading e-commerce platform having great features. Magento is one of the secure ecommerce platforms and that is one of the reasons to choose Magento over other platforms for your e­commerce store development. In fact, For E-commerce websites, people give the first priority to Magento development company for several reasons. Thing is that there are lots of cyber attacks risk also involved. 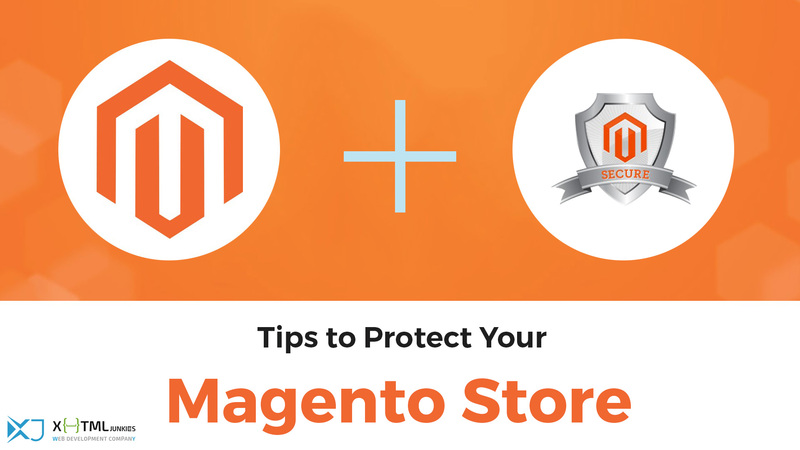 If you are concerned about your Magento store security, hire Magento experts to developer secure E-commerce stores, this article will help you with some extra security tips against smart hackers. As an admin of a store, you need to be extra careful while choosing a username and password. An ideal password must not be less than 15 characters and should have punctuation and both upper and lower case letters. If you make your admin password powerful enough, you can keep 50 % of hackers away from your Magento store. There is no harm in keep changing your password after every couple of months to increase the level of security. Having a strong password sometimes is not enough to protect your Magento store. It is recommended to create multiple layers of authentication to increase the level of security. The password you set for Magento should be exclusive for that. Never use that particular password for any other account. It is pretty easy for a hacker to hack passwords for your email account and other simple accounts and he will try that one on your Magento account too. You may have noticed that every website gives you the option to save password so that you do not have to go through login process every time you visit them. It is suggested never to save a password for Magento e-commerce store or you will be giving a free invitation to hackers. As a professional Magento store owner, you must have an effective backup plan for your e-store. It will be a lifesaver for you in case your store is being hacked by a hacker. If you want to provide extreme security to your Magento e-store, you can restrict the admin access to specific IP address only. That way no one from any other IP address will be able to access admin account of your e-store. This is often neglected but most important tip which will help you in creating a shell against those smart hackers. You must always update your Magento software with the latest version available. The new version usually tries to overcome the security risks which were faced by the previous software. An up-to-date anti-virus is necessary to keep your computer away from unwanted viruses. It is also required if you do not want a hacker to put a key-logger on your laptop. It is a common practice that company owners prefer to make an email address with their first and last names. This makes it pretty easy for a hacker to guess your email address and start hacking your Magento admin account. It is advised not to use obvious words when it comes to choosing a company email address and keep your Magento admin email address exclusive. This is an easier way for a hacker to reach into your Magento e-commerce store. Strictly lockdown your Magento connect manager for anyone to access it without your permission. Online business always comes with security threats. If you want to run a secure e-commerce store, apply above mentioned security tricks to enjoy safe business.